Stories of beginning a new life are by no means an uncommon occurrence in either fiction of real life. Many of these tales hail from those emigrating to America, hoping to thrive in the land of opportunity. Of course, these streets paved with gold may end up looking a bit tarnished to some. 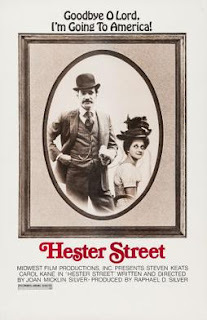 Silver was moved by Hester Street's source novel -- Abraham Cahan's Yekl: A Tale of the New York Ghetto -- because her parents were Russian Jews, prompting her to tell this story. (As well as changing the title, she changed the story's point of view from Jake to Gitl.) She felt it served as an ode to her heritage, and that's why Silver wanted this story to be told. Their names aside, there are noted differences between Jake and Gitl. He has all but discredited his faith in favor of living the American way whereas she holds the one thing from the old world close to her heart. Were it not for their son, their relationship would have been over long before their emigration took place. Hester Street is very much Silver's sonnet to where she came from, yes, but it's also a story of those who strive for a new life. Whether it's the past century or this current one, many of us have that desire to begin anew. But very seldom do we all achieve that possibility, especially one with a happy resolution.